produce supplemental or artificial light for indoor plant growth. change your grow light bulb after 12 months of continuous use. The trigger voltage of our ballast is 7000V, and output frequency is 100K. If your ballast cannot reach the standard, then our bulb cannot be lighted up. 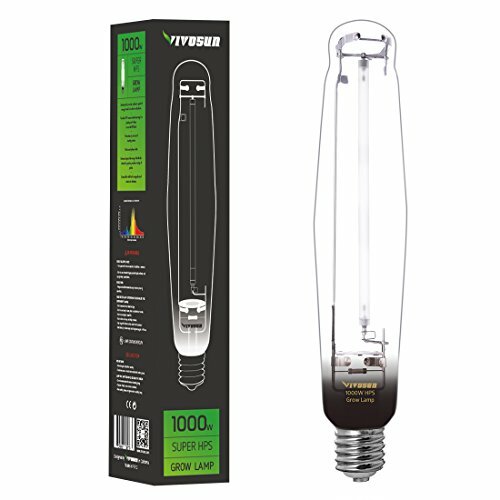 1000W VIVOSUN HPS bulb compatible with electronic and magnetic ballasts, 140000 Lumens, E39 Base. Optimized red & orange spectrum and high PAR (Photosynthetic Active Radiation) to stimulate flower growth and enhance fruiting. Extra-low lumen depreciation: maintaining over 90% of initial lumen output after running for 5,000 hours. Startup Time: allow 2-3 mins for full bright. After power off, do please wait at least 5 mins before striking again.